Violins should fit their players. The size makes a difference in both the distance the musician must reach to the fingerboard and the distance the notes are separated on the fingerboard. 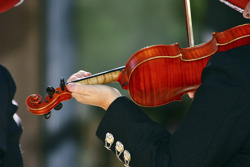 Violin sizes are measured in fractions: 4/4, 3/4, 1/2, 1/4, 1/8, etc. However this fraction nomenclature can be misleading because, for example, a 1/2 size violin isn't really half the size of a 4/4 violin, as you can see by the chart below. Often the teacher will measure the student and write down the correct size to get. If your teacher recommends a size, you should get that size regardless of any measurements anyone else might do. 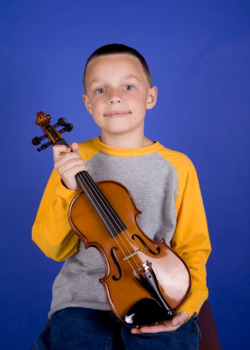 Otherwise to fit a player to a violin, place the violin under the student’s chin in playing position. The instrument fits if the student is able to cup the scroll (the far end) of the violin with his hand.